on a side note, i need a decent camera. and to learn how to take appetizing pics of food. but yay! i can't wait to start messing about with this recipe! Looks like you did very well for a first timer. Consider playing with some other folding techniques next time. i misestimated how many wrappers actually came in a pack. bought three packs. opened it up, HOLY BALLS, WRAPPERS. They keep really well. You can freeze unopened packages as long as you're patient defrosting them. Most of the wrappers at my local Asian grocer are sold frozen, actually. I tend to have the opposite problem, I make too much filling. In a way it's a better problem to have because it makes the need to prepare MOAR DUMPLES much more urgent. anyone ever do beef in theirs? im a HUGE beef lover. You can make a beef filling. You can make just about any filling. Dumplings are good that way. Yeah, I think beef is less common in Asian dumples simply because beef itself is a little less common in Asia. Relative to Europe and the Americas, anyway. I more commonly see pork, chicken, duck, shrimp, veggies. Or, it could be a texture thing. ground beef purchased, more dumplings on teh way! Bakemaster wrote: Who likes dumplings? All kinds of dumplings! When I was younger I loved peking ravioli, which Wikipedia tells me is a specifically Bostonian name for Jiaozi/potstikkers. So that's interesting. And I do love matzo balls to death. BUT! My absolute favorite has got to be Momos. One of my friends from highschool (and currently roommate) is from Nepal and he and his family introduced me to the wonder that is a night full of Momos. Steamed in stacking metal steamer pans, eaten as they come out, making them pretty much all night—there were 300 last time but I wasn't in top form so I only had about 30. I can't compete with my friend, though. He claims his record is around 75. I need to get this girl's recipe for the sauce she makes to go with them, or pay very close attention next time she makes it. If I get something useful I will post it. The actual recipe they follow is fairly approximate. Ground meat, either chicken, turkey or pork, is mixed with garlic, ginger, yellow onion, green onion, tomato and spices. Everything's pretty much minced or finely chopped. I keep trying to figure out the spices but they only know the nepali names of them; I recognize cumin and turmeric and I'm working on the rest. Oh and also a stick or two of melted butter, which sounds and looks sort of gross, but I have long since stopped caring. You see, she quotes me because I prepared a batch of momo filling tonight. In this post: I discover that I have forgotten just about everything I knew about BBCode. Also: these are jiaozi I made this year. Thank you! The picture got a good (envious) response on Facebook, and it also got a good response from the person I made the dumplings for. I think that was the time I tried something new and put shiitake mushrooms in the filling. Oh. My. God. Best necro of the year. All *checks watch* dozen or so hours of it. Lucky for you that this forum sent a COMPLETELY RANDOM notification email that someone had posted in a Games thread that I was apparently following, and I logged back in out of curiosity! They look great! I want to make dumplings. The greasy spoon near my work does a great pork dumpling soup. I don't usually make dumplings - I make tasty things, but I don't do great with finishing. Normally it means stuff isn't pretty, but with dumplings it can have bad results if you're not careful. I still mostly stick to basics. Ground turkey (or pork or beef) + cabbage + carrot + green onion + soy sauce + rice wine + sesame oil + various spices. In the picture I posted, there were shiitake mushrooms. The most recent batch I made, I tried out Chinese Five-Spice powder from Penzeys. Gave it a nice spicy kick. Note to all would-be dumpling makers - when making the filling, you need to follow this order of steps: Chop/process the vegetables, flavor the vegetable mixture with your flavoring agents, THEN mix in the ground meat. This way you can taste test your filling without, y'know, ingesting dangerous bacteria. This is excellent advice, it is a delight to see your return in dumpled glory. I've started to have friends requesting dumplings as their Christmas presents in lieu of anything else. I'm just glad I can preserve this piece of my heritage. 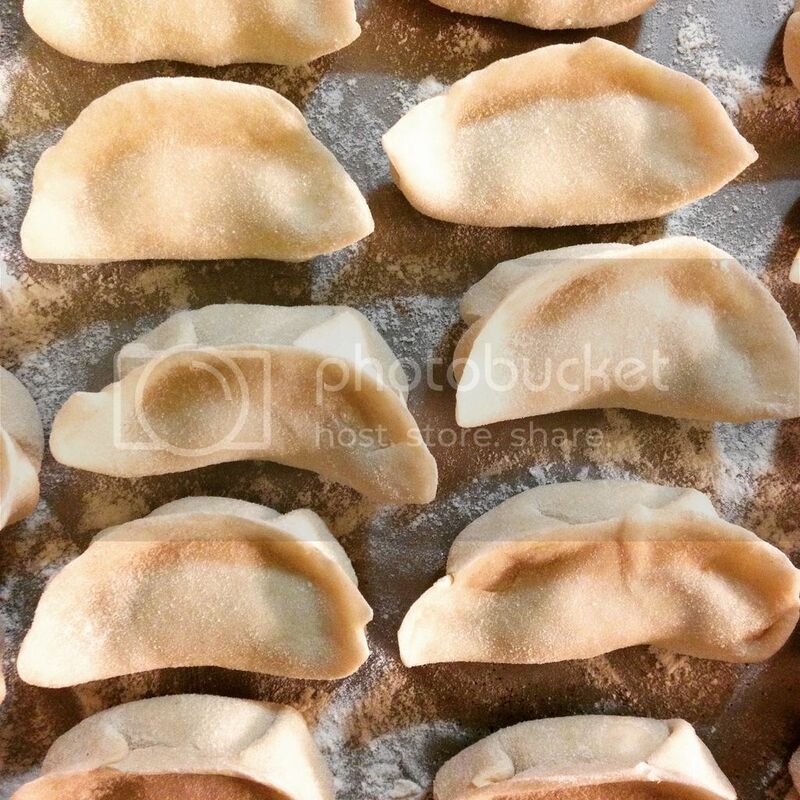 My next challenge is the gluten-free jiaozi, which will be a serious one. Googling turns up literal dozens of different suggestions, recipes and techniques. My favorite was the one that tried sticking two spring roll wrappers together. So I tried the $2/box shumai and har gow they have in the freezers at the Vietnamese grocery this past week. Yuge mistake, I'm telling you, the worst. I imagine these to be basically China's equivalent of off-brand Bagel Bites. Gonna stick with the $6/bag frozen baozi that I know are good, and maybe figure out how to make har gow myself because they are my son's favorite dim sum item. Needless to say, I will report back at such time as I have the opportunity to try it. podbaydoor wrote: Lucky for you that this forum sent a COMPLETELY RANDOM notification email that someone had posted in a Games thread that I was apparently following, and I logged back in out of curiosity! Yesssssssssss. I HAVE BEHELD. And it was good. GF wrappers sounds like a really rough time. Report back! Also: the family dumpling-making scene in Crazy Rich Asians was flippin’ revelatory in terms of seeing such a major part of my growing-up experience receiving the big American mainstream movie treatment. I didn’t cry, but I did have a huge, wondering grin on my face. This is how white people feel all the time in movies, isn’t it.